The 4610 High Precision Thermometer can be used with any of the 4610 series probes available from Ixthus Instrumentation. When used with these probes, the system accuracy (between +20°C to +50°C) is ±0.05°C. 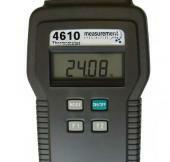 The 4610 thermometer has RS-232 communication capability and offers both °C and °F readout options.